Diego Pérez, "Selfie on the Wall," 2018, oil on canvas, 72 x 96"
A small self-portrait hangs inside the gallery entrance, reminiscent of portraits painted by Caravaggio, who Diego Pérez hails as a major influence. The painting reveals the Mexican artist’s affinity for using light to punctuate the darkness of both physical and emotional spaces. Playing with myriad intersections between cultures, historical periods, and methods of communication, Pérez creates works that thrust us into a tenuous threshold between the familiar and the strange, as if to signal that nothing one experiences or assumes should be taken at face value. His fondness for humor and irony are on full display in 18 paintings that capture America’s dance with real crises and manufactured melodrama. More than half are culled from the artist’s ongoing “Tragedy” series, in which subjects are placed in perilous or perplexing settings. Collectively, these paintings speak to the prevalence of manufactured melodrama within a world where actual trauma too often goes unheeded. In “Tragedy IX” two hands grip a torn paper towel being pulled from a dispenser. “Tragedy IV (Skate Cowboy)” imagines a cowboy atop his horse, about to wipe out over a graffiti-laden skateboard ramp. For “Tragedy V (Sunday Walk),” a man sits watching television in his underwear, holding a leash attached to a treadmill rather than the dog standing atop it. Exhibition highlights also include a pair of large-scale paintings, each created using four canvases and measuring 72 x 96 inches. 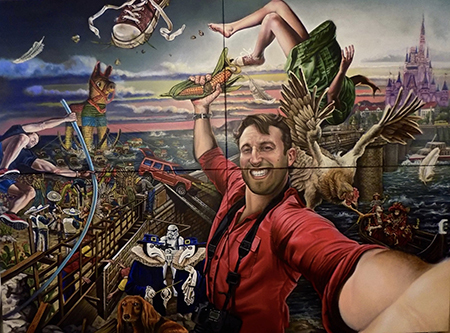 Both “Little Global Village” (2018) and “Selfie on The Wall” (2017) illustrate the artist’s facility for blending art historical and pop culture references, often in the service of critiquing specific elements of contemporary American life, such as anti-social impulses fueled by social media. The latter depicts a man in a bright-red shirt, snapping a selfie as he grasps a broken corncob raised in apparent triumph. Behind him is a giant piñata, reminiscent of Trojan Horse lore, and a wall under construction. Star Wars Stormtroopers stand next to Black Plague doctors wearing beak masks, reminding us that history and its retelling can be a very messy (and humorous) business.